Opening the Times-Call Thursday, June 25, to find yet another Kaye Fissinger opinion piece attempting to justify the increasingly indefensible antics of some of the current city council members shouldn’t have surprised me the way that it did. I should be accustomed by now to her tireless assaults on LIFT, a local non-partisan pro-business group, which she evidently sees as threatening to her friends on the City Council. Admittedly, I was amused by her vehement insistence that Longmont must not return to the way it was in “the ‘70s, ‘80s or even the past two decades” and must adhere to her (undefined) vision for Longmont’s future. Kaye Fissinger, the author, moved here from California less than five years ago. Let that resonate with you for a moment. Kaye Fissinger riddled her piece with falsehoods. She claims there was no involvement of certain council members with the “solely grassroots effort” to run the Union development off (and into the waiting arms of an all-too-eager-to-take-the-tax-revenue neighboring community). This is an outrageous untruth, with photographic evidence to the contrary. Karen Benker most assuredly did “actively participate” in stopping the Union project. This issue is Sean McCoy’s own personal crusade. These are not secrets, and don’t warrant being lied about. Don’t let Miss Fissinger convince you that this was some sort of mandate by the people, a great uprising and ground-swell of populism. It was actually a very small number of people who imposed their will on the town because they got up and got active. We, the people, slept and dawdled while she and her few friends went out and stood at the grocery stores collecting signatures and ended up miring us in the mess we find today. Fissinger readily admits that Karen Benker was anti-Union from the start as the “lone vote against it in August 2007” and Miss Fissinger should know well, as she, herself, did “organize, direct and actively participate in this effort”. Current city council members not only ran off the Union project, but also instigated the ill-advised attempt to stop another city from developing it and then pushed our city into a losing legal action to try to stop it. And guess what? Now we’re all on the hook for the cost of their crusade against a church development and we’re out the very capable city attorney who advised them NOT to pursue the action that will now be costing the city hundreds of thousands of dollars. Well done. This is what happens when we sleep at the wheel, people. She piously accuses LIFT of secretive actions and tells you to be alarmed by “resistance to responsibility and accountability”. She may as well be talking of your council, who have ceaselessly pursued their own agendas to the detriment of the city and its budget. Are we going to allow our council to continue this ill-charted course in fighting a losing court battle? Your council has already decided they will appeal. Without your input. In a CLOSED meeting. Without your consent. Talk about a lack of daylight! Do you want to owe more money to this lost cause? The judge found that this council’s actions “exceeded its jurisdiction” and it “abused its discretion”. Are we going to continue to let them waste our city money fighting their own agendas against organized religion and “big business”? (News flash: 4C is not “big” business by any means. We’re not talking GE or WalMart here, folks) When do we say enough is enough? The council is asking our city workers to volunteer for furlough, and yet apparently feels it has no end to resources when it comes to throwing money around for court costs. Is this what you voted for? Or were you, like me, asleep at the wheel? Miss Fissinger seems to truly dislike the town she has adopted. She writes of the “accomplishments” of this council and screeches of failings of a group of business people who would like to see the city get back on track. I think I can sum up what the council has done recently pretty simply and without subterfuge. Stalled a mall redevelopment until the developer could no longer financially pursue redevelopment, thereby forgoing that tax revenue. Funneled tax-payer money to a redundant incubator. Ran a large development into the waiting arms of a neighboring town, thereby forgoing that tax revenue. Scuttled a city attorney who wisely advised them not to pursue a losing court battle with that neighboring town. Was found liable for those court costs to the tune of over one-hundred thousand dollars (with certainly more to come). Saved some prairie dogs at the airport. Allowed the good citizens of Longmont to get back to their agrarian roots by housing chickens, both legal and illegal. Installed some solar panels at the local pools. Yep. That pretty much sums it up. Thanks for all visionary leadership toward the future, council. Do you hate Longmont as much as Kaye Fissinger? Considering the fine mess this council has gotten us into, “the 70’s, 80’s and even the past two decades” aren’t looking too bad, are they? 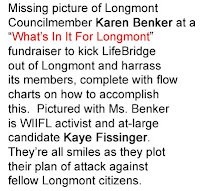 ProgressNow leftist Kaye Fissinger seeths in rage at city council meeting over her imagined evils in Longmont–even making a “lies” accusation straight out of Third Reich propaganda. (PITBH; 2-17-09). ProgressNow activist Kaye Fissinger disgracefully scorns new Longmont Mayor Roger Lange at a City Council meeting on Dec. 18, 2007. Fissinger ranted that Mayor Lange was not fit to serve on a Weld County Partnership committee due to his supposed pro-development bias. I was the only City Council member who voted against the an-nexation of the LifeBridge Union development, and I would like to provide the reasons why I decided to vote that way. I voted no after many hours of study, staff input and discussions with Longmont residents. I read hundreds of pages of information provided to council from the Life-Bridge developers and city staff, and distilled the key issues to the following facts. Facts LifeBridge developers contracted for their own retail cost-benefit study to demonstrate that their development would provide a financial benefit to Longmont. Their own study stated “residential impact of annexation would create a deficit of approximately $890,000 per year at buildout.” If retail is considered, it showed a positive gain. However, the study built its retail assumptions on the development having 53 retail stores grossing $453 per square foot each year. Current, Longmont retail stores average $190 per square foot. Their revenue assumptions appear exaggerated. Therefore, providing city services to this development will cost Longmont taxpayers at a time when the city is preparing to cut budgets and lay off employees. Fact: First, we all agree that the three church buildings, which are valued at $200 million, will be tax exempt. The critical tax issue for the city is whether use taxes will be paid when the developer is issued its building permits. (These are sales taxes paid to the city of Longmont on buildings’ construction materials.) LifeBridge formed the 4C nonprofit corporation. Therefore, when I asked (several times) whether it will pay use taxes on the $25 million sports arena, the church did not answer yes or no. It said it would pay all legally owed taxes. Is there a loophole that will be used since it is a non-profit corporation? We don’t know. This would be a significant revenue loss to the city. In fact, the reason why the city budget is being reduced next year is due to the projected reduction of use taxes. Fact: Traffic would greatly increase on Colo. Highway 119 and on Ninth Avenue. The traffic study prepared for and paid by the developers states that current average daily traffic on Colo. 119 is 30,000 vehicles. This new Union development would add an additional 17,520 trips per day in the next five years. City staff are already planning to increase Colo. 119 to six lanes in response to this development. In addition, a new road would lead directly from the Union development to merge with Ninth Avenue. This will become the new crosstown thoroughfare into the city, and a preliminary study shows Ninth Avenue daily average traffic increasing from 7,400 to 19,000 trips in 2025. Fact: Originally, the developers for LifeBridge asked City Council not to annex their property into the city. Several months later, they .changed their mind. I asked them at a council meeting why. They said that when they did their calculations, the price of water in Longmont was much cheaper than securing a source from a water district in Weld County. In fact, according to city staff, coming into Longmont would save Union developers between $14 million and $23 million in water costs. That was the only reason given to me as to why they wanted to be annexed. Fact: When the Clover Basin residential development began, it needed a new fire station. The city stated that it would not pay for it at that time, so the developer created a special district, and now every resident in the Clover Basin neighborhood is paying higher property taxes until 2015 for construction and operation of the station. Union developers asked the city to pay for the $2.7 million construction of a new fire station that will cost $1.4 million each year to operate. The developers were able to have this written into the annexation agreement. Fact: The LifeBridge developers requested several exemptions to this city requirement. First, they asked city staff to reduce the affordable-housing units from 10 percent to 5 percent of the total number of homes to be built. Then they requested to provide funds to Habitat for Humanity programs to build the homes off the Union site. Finally, after nine months of being questioned about why they wanted an exemption, they changed their minds and decided to comply with city ordinance. Fact: Several years ago, the city was in negotiation with the original property owner to purchase these 313 acres for open space to buffer Longmont from the uncontrolled growth in Weld County. LifeBridge Christian Church offered the landowner a higher price, and the city lost the deal. However, it is important to note that this land was planned for city open space and to establish Longmont’s eastern boundary. Now, the city’s eastern boundary line is in question. Fact: The city has never granted a five-year vesting right for retail development or a 15-year vesting right for church structures. Union is an exception to the development code. This is important, because it is a rare occurrence for the city to provide vesting rights, and now we have established a precedent that other developers may cite. A vesting right means that all plans and plats cannot be changed by either party for the time period that is set. Considering that the developers provided City Council with a preliminary plat with no proposed buildings for the commercial and religious properties, we do not even know what we have vested. In summary, the first buildings to be constructed next year at the Union development site will be the $25 million sports arena and the estate homes priced at up to $2.25 million. The 400,000-square-foot church would be the last building to be built; it is scheduled for construction in 2020. ‘ I believe this development would cost Longmont taxpayers millions of dollars to provide city services this far east of the city. Because of a citizens’ initiative that is being circulated throughout Longmont, you now have a chance to make your own decision about this development plan and vote on this issue yourself. Do you want to vote on this issue? If you want to learn more, visit WhatsInItForLongmont.org. The 2007 Campaign by Karen Benker for Mayor of Longmont offers a fake cure for her phony charge Council “rubber-stamps” development applications. 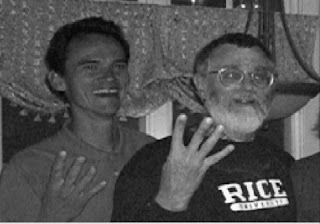 Rights serve as rules of interaction between people and Government, and as such, they place restraints and obligations upon the actions of collective Council actions as well as upon groups including Benker’s noisy minority (among them “What’s In It For Longmont”‘s Kaye Fissinger). If you have a Constitutional right to life, this means that the Boulder liberals do not have the liberty to kill you or liberty to steal your property for Government redistribution for open space. But, the cool-aide they are trying to sell to Longmont voters to elect Benker Mayor is the notion that because the Constitution’s Bill of Rights are enshrined in natural law members of Council cannot legitimately use the Bill of Rights to protect private property rights because the connotation is “religious”. Her supporters claim the Establishment Clause protects only secularists who they claim are free to interfere in City affairs and are granted, in Benker’s opinion, the right to control government from the public speakers’ podium. The flaw in Benker’s theory is the U.S. Supreme Court decision in 1961 finding Secular Humanity philosophy a religion. Benker’s supporter’s bloviating against LifeBridge is pure hypocrisy, nothing more, nothing less. Voters, awake to the defense of your City Government, lest it be neutralized in protecting your rights. Vote for Roger Lange Mayor to preserve your freedoms guaranteed by the Bill of Rights thus, keeping Longmont the great All-American City it is.